A loyalist flag bearing the Red Hand of Ulster and the loyalist slogan "For God and Ulster"
Ulster loyalism is a political ideology found primarily among Ulster Protestants in Northern Ireland (and to a lesser extent Scotland) who maintain a strong desire to remain part of the United Kingdom. Many Ulster Protestants are descendants of settlers from Great Britain in the 17th and 18th centuries. Like most unionists, loyalists are attached to the British monarchy, support the continued existence of Northern Ireland, and oppose a united Ireland. Ulster loyalism has been described as a kind of ethnic nationalism and "a variation of British nationalism". It is strongly associated with paramilitarism. Ulster loyalism emerged in the late 19th century, as a response to the Irish Home Rule movement, and the rise of Catholic Irish nationalism. Although most of Ireland was Catholic, in the province of Ulster, Protestants were the majority. Ulster was also more industrialized than other parts of Ireland and was heavily dependent on trade with Great Britain. Loyalism began as a self-determination movement among Ulster Protestants who did not want to become part of an autonomous Ireland. While some Irish Catholics were also unionist, loyalism emphasized a Protestant and British heritage. These movements led to the partition of Ireland in 1921; most of Ireland became an independent state, while about two-thirds of Ulster remained within the United Kingdom as a self-governing territory called Northern Ireland. 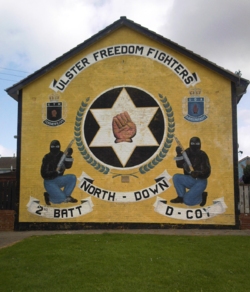 Loyalists often use 'Ulster' as an alternative name for Northern Ireland. Since partition, most loyalists have supported upholding Northern Ireland's status as a part of the United Kingdom, i.e. unionism. Historically, the terms 'unionist' and 'loyalist' were often used interchangeably; however, since the resurgence of loyalist paramilitarism in the 1960s (at the start of The Troubles), a distinction between the two is made more often. The term 'loyalist' is now usually used to describe working class unionists who are willing to use, or tacitly support, paramilitary violence to defend the Union with Britain. Loyalists are also described as being loyal primarily to the Protestant British monarchy rather than to the British government and institutions. Garret FitzGerald argued that loyalists are loyal primarily to 'Ulster' rather than to 'the Union'. A small minority of loyalists have called for an independent Ulster Protestant state, believing that they cannot rely on the British government to prevent Irish reunification (see Ulster nationalism). In Northern Ireland there is a long tradition of militaristic loyalist Protestant marching bands. There are hundreds of such bands who hold numerous parades each year. The yearly Eleventh Night (11 July) bonfires and The Twelfth (12 July) parades are strongly associated with loyalism. The term loyalist was first used in Irish politics in the 1790s to refer to Protestants who opposed Catholic Emancipation and Irish independence from Great Britain. Upon the partition of Ireland in 1921, six of the nine counties in the province of Ulster did not join the newly independent Irish Free State (later the Republic of Ireland) and remained a part of the United Kingdom. Academically cited records from 1926 indicate that at that stage 33.5% of the Northern Ireland population was Roman Catholic, with 62.2% belonging to the three major Protestant denominations (Presbyterian 31.3%, Church of Ireland 27%, Methodist 3.9%). Tensions between Northern Ireland's Catholic population (which mostly supported Irish reunification) and its Protestant population (which mostly supported remaining part of the UK) led to a long-running bloody conflict known as the Troubles from the late 1960s to the late 1990s. In Great Britain, a number of small far-right parties have and still do express support for loyalist paramilitaries, and loyalism in general. This includes the National Front (who registered to stand in Northern Ireland), the British People's Party and Britain First. Bigger and more moderate right-wing unionist parties like the Ulster Unionists (UUP) or Democratic Unionists (DUP) usually seek to distance themselves from loyalist paramilitary activity. However, Ian Paisley and his Democratic Unionist Party have been involved with Ulster Resistance and worked alongside loyalist paramilitaries such as the Ulster Defence Association in the 1974 Ulster Workers' Council Strikes and the 1977 Loyalist Association of Workers strike. Loyalist paramilitary and vigilante groups have been active since the early 20th century. In 1912, the Ulster Volunteers were formed to stop the British Government granting self-rule to Ireland, or to exclude Ulster from it. This led to the Home Rule Crisis, which was defused by the onset of World War I. Loyalist paramilitaries were again active in Ulster during the Irish War of Independence (1919–22), and more prominently during the Troubles (late 1960s–1998). The biggest and most active paramilitary groups existed during the Troubles, and were the Ulster Volunteer Force (UVF), and the Ulster Defence Association (UDA)/Ulster Freedom Fighters (UFF). They, and most other loyalist paramilitaries, are classified as terrorist organizations. During the Troubles, their stated goals were to combat Irish republicanism – particularly the Irish Republican Army (IRA) – and to defend Protestant loyalist areas. However, the vast majority of their victims were Irish Catholic civilians, who were often killed at random in sectarian attacks. Whenever they claimed responsibility for attacks, loyalists usually claimed that those targeted were IRA members or were helping the IRA. M. L. R. Smith wrote that "From the outset, the loyalist paramilitaries tended to regard all Catholics as potential rebels". Other times, attacks on Catholic civilians were claimed as "retaliation" for IRA actions, since the IRA drew most of its support from the Catholic community. Such retaliation was seen as both collective punishment and an attempt to weaken the IRA's support; some loyalists argued that terrorizing the Catholic community and inflicting a high death toll on it would eventually force the IRA to end its campaign. Loyalist paramilitaries were responsible for about 30% of all deaths in the Troubles, and were responsible for about 48% of all civilian deaths. The modus operandi of loyalist paramilitaries involved assassinations, mass shootings, bombings and kidnappings. They used sub machine-guns, assault rifles, pistols, grenades (including homemade grenades), incendiary bombs, booby trap bombs and car bombs. Bomb attacks were usually made without warning. However, gun attacks were more common than bombings. In January 1994, the UDA drew up a 'doomsday plan', to be implemented should the British Army withdraw from Northern Ireland. It called for ethnic cleansing and re-partition, with the goal of making Northern Ireland wholly Protestant. Some loyalist paramilitaries have had links with far-right and Neo-Nazi groups in Britain, including Combat 18, the British National Socialist Movement, and the British National Front. Since the 1990s, loyalist paramilitaries have been responsible for numerous racist attacks in loyalist areas. A 2006 report revealed that of all reported racist attacks in the previous two years, 90% occurred in loyalist areas. In the 1990s, the main loyalist paramilitaries called ceasefires. Following this, small breakaway groups continued to wage violent campaigns for a number of years, and members of loyalist groups have continued to engage in sporadic violence. Ulster Protestant Association UPA 1920–1930s Most members recruited into the B Specials. Some activity continued into the mid-1930s. Down Orange Welfare (DOW), 1972–? Ulster Service Corps (USC), 1976–? The name Protestant Action Force (PAF) was also occasionally used by loyalists during the Troubles. It has been suggested that PAF was a covername used by a semi-independent group (or groups) within the UVF who were carrying out attacks on their own initiative or without the sanction of the UVF leadership. There were incidents of collusion between the British security forces (the British Army and RUC) and loyalist paramilitaries. This included soldiers and policemen taking part in loyalist attacks while off-duty, giving weapons and intelligence to loyalists, not taking action against them, and hindering police investigations. The De Silva Report found that, during the 1980s, 85% of the intelligence loyalists used to target people came from the security forces. The security forces also had double agents and informers within loyalist groups who organised attacks on the orders of, or with the knowledge of, their handlers. Of the 210 loyalists arrested by the Stevens Inquiries team, 207 were found to be state agents or informers. The British Army's locally recruited Ulster Defence Regiment (UDR) was almost wholly Protestant. Despite the vetting process, some loyalist militants managed to enlist; mainly to obtain weapons, training and intelligence. A 1973 British Government document (uncovered in 2004), Subversion in the UDR, suggested that 5–15% of UDR soldiers then were members of loyalist paramilitaries. The report said the UDR was the main source of weapons for those groups, although by 1973 UDR weapons losses had dropped significantly, partly due to stricter controls. By 1990, at least 197 UDR soldiers had been convicted of loyalist terrorist offences, including 19 convicted of murder. This was only a small fraction of those who served in it, but the proportion was higher than the regular Army, the RUC and the civilian population. Initially, the Army allowed soldiers to be members of the Ulster Defence Association (UDA). Despite its involvement in terrorism, the UDA was not outlawed by the British Government until 1992. In July 1972, Harry Tuzo (the Army's GOC in Northern Ireland) devised a strategy to defeat the IRA, backed by Michael Carver, head of the British Army. It proposed that the growth of the UDA "should be discreetly encouraged in Protestant areas, to reduce the load on the Security Forces", and suggested they "turn a blind eye to UDA arms when confined to their own areas". That summer, the Army mounted some joint patrols with the UDA in Protestant areas. In November 1972 the Army ordered that a soldier should be discharged if his sympathy for a paramilitary group affected his performance, loyalty or impartiality. Within three years, 171 soldiers with UDA links had been discharged. During the 1970s, the Glenanne gang—a secret alliance of loyalist militants, British soldiers and RUC officers—carried out a string of attacks against Catholics/nationalists in an area of Northern Ireland known as the "murder triangle". It also carried out some attacks in the Republic of Ireland. Lethal Allies: British Collusion in Ireland claims the group killed about 120 people, mostly uninvolved civilians. The Cassel Report investigated 76 murders attributed to the group and found evidence that soldiers and policemen were involved in 74 of those. One member, RUC officer John Weir, claimed his superiors knew of the collusion but allowed it to continue. The Cassel Report also said some senior officers knew of the crimes but did nothing to stop it. Attacks attributed to the group include the Dublin and Monaghan bombings (1974), the Miami Showband killings (1975) and the Reavey and O'Dowd killings (1976). In 1977, the Army investigated a UDR battalion based at Girdwood Barracks, Belfast. The investigation found that 70 soldiers had links to the Ulster Volunteer Force (UVF), that thirty soldiers had fraudulently diverted up to £47,000 to the UVF, and that UVF members socialized with soldiers in their mess. Following this, two were dismissed. The investigation was halted after a senior officer claimed it was harming morale. Details of it were uncovered in 2011. The Stevens Inquiries found that elements of the British security forces had used loyalists as "proxies". Through their double-agents and informers, they helped loyalist groups to kill people, including civilians. It concluded that this had intensified and prolonged the conflict. The Army's Force Research Unit (FRU) was the main agency involved. Brian Nelson, the UDA's chief 'intelligence officer', was a FRU agent. Through Nelson, FRU helped loyalists target people for assassination. FRU say they helped loyalists target only republican activists and prevented the killing of civilians. The Inquiries found evidence only two lives were saved and that Nelson/FRU was responsible for at least 30 murders and many other attacks – many on civilians. One victim was solicitor Pat Finucane. Nelson also supervised the shipping of weapons to loyalists in 1988. From 1992 to 1994, loyalists were responsible for more deaths than republicans, partly due to FRU. Members of the security forces tried to obstruct the Stevens investigation. A 2007 Police Ombudsman report revealed that UVF members had been allowed to commit a string of terrorist offences while working as informers for RUC Special Branch. It found that Special Branch had given informers immunity and had blocked weapons searches. Ombudsman Nuala O'Loan said this led to "hundreds" of deaths and said senior British Government officials pressured her into halting her investigation. UVF brigadier Robin 'the Jackal' Jackson has been linked to between 50 and 100 killings, although he was never convicted of any. It has been alleged by many people, including members of the security forces, that Jackson was an RUC agent. According to the Irish Government's Barron Report, he was also "reliably said to have had relationships with British Intelligence". Other incidents of alleged collusion between loyalists and the security forces include the McGurk's Bar bombing, the 1972 and 1973 Dublin bombings, the Milltown Cemetery attack, the Cappagh killings, the Sean Graham bookmakers' shooting, the Loughinisland massacre, and the murders of Robert Hamill, Rosemary Nelson, and Eddie Fullerton. In Northern Ireland there are a number of Protestant fraternities and marching bands who hold yearly parades. They include the Orange Order and Apprentice Boys of Derry. These fraternities, often described as the "Loyal Orders", have long been associated with unionism, and loyalism in particular. There are also hundreds of Protestant marching bands in Northern Ireland, many of whom hold loyalist views and use loyalist symbols. Yearly events such as the Eleventh Night (11 July) bonfires and The Twelfth (12 July) parades are strongly associated with loyalism. A report published in 2013 estimated there were at least 640 marching bands in Northern Ireland with a total membership of around 30,000, an all-time high. According to the Parades Commission, a total of 1,354 loyalist parades (not counting funerals) were held in Northern Ireland in 2007. The Police Service of Northern Ireland uses different statistics, and recorded a total of 2,863 parades in 2007. Of these, 2,270 (approximately 80%) were held by loyalist marching bands. ^ John McGarry and Brendan O'Leary. Explaining Northern Ireland. Wiley, 1995. pp.92–93. ^ Bruce, Steve. The Red Hand: Protestant Paramilitaries in Northern Ireland. Oxford University Press, 1992. p.15. ^ Alison, Miranda. Women and Political Violence. Routledge, 2009. p.67. ^ Cochrane, Fergal. Unionist Politics and the Politics of Unionism since the Anglo-Irish Agreement. Cork University Press, 2001. p.39. ^ Arthur Lyon Cross (1920). A shorter history of England and greater Britain. The Macmillan company. pp. 593–595, 597. Retrieved 18 November 2011. ^ "Background Information on Northern Ireland Society – Religion". Conflict Archive on the Internet. Retrieved 21 August 2016. ^ Simpson, Claire (8 June 2017). "DUP has been criticised for loyalist links". The Irish News. Retrieved 11 June 2017. ^ Morris, Allison (10 June 2017). "Allison Morris: DUP now need to repay loyalist loyalty". The Irish News. Retrieved 11 June 2017. ^ Bowcott, Owen (11 June 2017). "DUP stance on loyalist paramilitaries called into question". The Guardian. Retrieved 11 June 2017. ^ National Front policies. Official National Front (UK) website. ^ "Stand by Loyal Ulster!" – British People's Party leaflet. Official British People's Party website. ^ "Irish War of Independence". The Irish War. 24 May 2010. Retrieved 1 December 2016. ^ "A history of the UDA". BBC News. 6 January 2010. Retrieved 28 March 2010. ^ a b McKittrick, David (12 March 2009). "Will loyalists seek bloody revenge?". The Independent. Retrieved 21 June 2011. ^ a b Mitchell, Thomas G (2000). "Chapter 7 subsection: The Loyalist terrorists of Ulster, 1969–94". Native vs. Settler. Greenwood Press. pp. 154–165. ^ "Sutton Index of Deaths: Summary of Organisation responsible". Conflict Archive on the Internet (CAIN). Retrieved 1 March 2016. ^ Wood, Ian S. Crimes of Loyalty: A History of the UDA. Edinburgh University Press, 2006. pp.184–185. ^ Goodrick-Clarke, Nicholas. Black Sun: Aryan Cults, Esoteric Nazism, and the Politics of Identity. NYU Press, 2003. p.45. ^ McDonald, Henry (2 July 2000). "English fascists to join loyalists at Drumcree". London: The Observer. Retrieved 30 December 2010. ^ Wood, Ian S.Crimes of Loyalty: A History of the UDA. Edinburgh University Press, 2006. pp.339–40. ^ "Racist war of the loyalist street gangs". The Guardian, 10 January 2004. Retrieved 21 October 2012. ^ "Loyalists linked to 90 per cent of race crime". The Guardian. 22 October 2006. ^ "Orange Volunteers claim Moneymore bomb attack". Mid Ulster Mail. 24 August 2009. Retrieved 29 January 2015. ^ "'Paramilitary threat to Belfast schools' - UTV Live News". U.tv. Archived from the original on 18 June 2015. Retrieved 29 January 2015. ^ Toan, Roberta. "Blast bomb victim 'lucky to be alive' - UTV Live News". U.tv. Archived from the original on 18 April 2013. Retrieved 29 January 2015. ^ "Pat Finucane murder: 'Shocking state collusion', says PM". BBC News, 12 December 2012. Retrieved 13 December 2012. ^ a b "UK agents 'worked with NI paramilitary killers'". BBC News, 28 May 2015. Retrieved 15 June 2015. ^ "Collusion – Subversion in the UDR". Irish News, 3 May 2006. ^ "CAIN: Public Records: Subversion in the UDR". Cain.ulst.ac.uk. Retrieved 29 January 2015. ^ John Eldridge. Getting the Message: News, Truth, and Power. Routledge, 2003. p. 79. ^ Brendan O'Leary and John McGarry. The Politics of Antagonism: Understanding Northern Ireland. Athlone Press, 1996. pp. 268-69. ^ Moloney, Ed. "Northern Ireland, 1972: a British army-loyalist paramilitary alliance". The Irish Times. 19 January 2013. ^ Moloney, Ed. "The Tuzo Plan, 1972: Extirpate The IRA And ‘Turn A Blind Eye To UDA Guns’", TheBrokenElbow.com, 17 June 2015. ^ "New Year Releases 2003 – Public Records of 1972". Conflict Archive on the Internet. Retrieved 21 August 2016. ^ The Cassel Report (2006), pp. 8, 14, 21, 25, 51, 56, 58–65. ^ a b c "Collusion in the South Armagh/Mid Ulster Area in the mid-1970s" Archived 26 April 2011 at the Wayback Machine. Pat Finucane Centre. Retrieved 2 January 2011. ^ Lethal Allies: British Collusion in Ireland - Conclusions Archived 22 February 2014 at the Wayback Machine, patfinucanecentre.org; accessed 6 March 2015. ^ a b c "British army 'covered up' UDR units links to UVF". The Detail, 31 July 2011. ^ a b c "Stevens Inquiry: Key people". BBC News. 17 April 2003. Retrieved 27 September 2013. ^ a b "Scandal of Ulster’s secret war", The Guardian, 17 April 2003; retrieved 27 September 2013. ^ a b "Security forces aided loyalist murders". BBC News. 17 April 2003; retrieved 27 September 2013. ^ a b "Obituary: Brian Nelson". The Guardian. 17 April 2003. Retrieved 27 September 2013. ^ "Deadly Intelligence: State Involvement in Loyalist Murder in Northern Ireland – Summary". British Irish Rights Watch, February 1999. ^ Human Rights in Northern Ireland: Hearing before the Committee on International Relations of the United States House of Representatives, 24 June 1997. US Government Printing Office, 1997. ^ Stevens Enquiry 3: Overview & Recommendations Archived 10 June 2011 at the Wayback Machine. 17 April 2003. Retrieved 27 September 2013. ^ "NI police colluded with killers". BBC News, 22 January 2007. ^ "Bombshell documentary uncovers Government collusion with loyalist paramilitaries", Belfast Telegraph, 12 June 2015; retrieved 15 June 2015. ^ Houses of the Oireachtas, Joint Committee on Justice, Equality, Defence and Women's Rights (2003). "The Barron Report" (PDF). Oireachtas. p. 135. ^ Simpson, Mark (10 July 2009). "Turning hotspot into friendly fire". BBC News. Retrieved 13 July 2009. ^ All information in this section from the Parades Commission website.